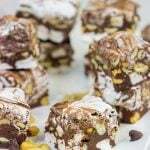 This Easy Rocky Road Fudge is loaded with peanuts, marshmallows and chocolate...and it can be made in about 15 minutes! Line an 8” square baking pan with foil or parchment paper. Spread 1 cup of mini-marshmallows evenly across bottom of pan; set pan aside. Using a medium saucepan, add chocolate chips and sweetened condensed milk. Cook over low heat, stirring often, until smooth. Remove pan from heat and stir in chopped peanuts, remaining 2 cups of mini-marshmallows and vanilla extract. Pour mixture into prepared baking pan, using a spatula to help spread mixture evenly. Heat marshmallow fluff in a microwavable bowl until soft (~15-20 seconds). Using a table knife, swirl the marshmallow fluff into the melted chocolate mixture.